The company was formed on the 6th August 1897 and taken over by Scotland's biggest train operator, the Caledonian Railway Company in 1902 just before the completion of the project. A vast fortune had been spent constructing the fifteen miles of track, numerous bridges and cuttings, a new road and seven stations through an extremely difficult urban landscape all the way to the outskirts of Newton Mearns. Barrhead New station was described as 'a grand building, a towering edifice with its name picked out in metal letters attached to metal strips. It might have passed as a picture house'. The derelict and not so grand remains of the station can be seen on the last page.It was demolished in the early 1950s. 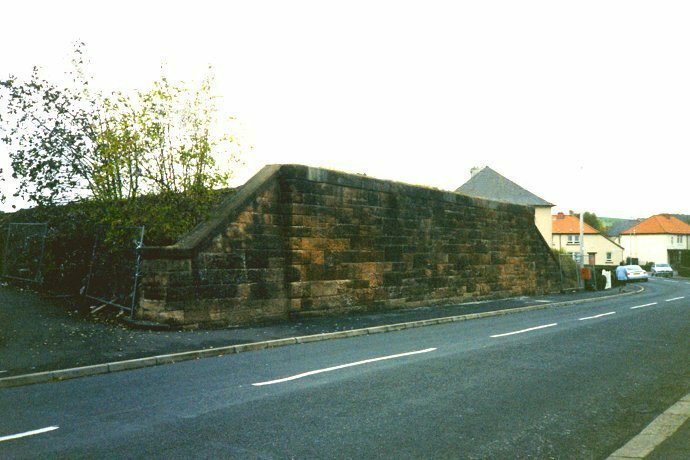 A massive stone viaduct was also constructed on the outskirts of Barrhead which is still there next to the Tesco supermarket on the road to Neilston as well as an enormous stone wall almost 100 feet high down the length of Lacy Street in Paisley (below) . Despite all that effort, no passenger ever bought a ticket, paced a platform or boarded a train on this Marie Celeste of the rails and it came to be known as 'the dummy railway'. The plan was to form a local loop by joining the line to the main Glasgow railway to the east and west of the town. One of the junctions was built but the other wasn't. An embankment and a bridge were constructed (see photographs below) and the track laid but it was deliberately stopped a few yards short of the main line. The reason it wasn't completed is that under Board of Trade regulations the company had agreed to run a certain minimum number of trains per day. The arrival of electric trams in 1903 made a local train service financially untenable. Trams could go almost anywhere, pick up passengers in more places and were a lot cheaper to run. The Battle of the Braes ended in farce. Both the Caledonian and the G & sw were driven from the field by the electric tram. The Caledonian admitted defeat when its line was nearing completion. Passenger stations, some of them almost ready for service, were abandoned before they had issued a single ticket. The loop (which would have included Paisley's main station, Gilmour Street) was to have been completed by joining the line to the main Glasgow railway near Paisley St. James station in the west and Paisley East station at a junction near Arkleston in the east. The railway then became two branches - St James, Ferguslie , Stanely, and Glenfield stations were on the west branch The east branch went from Paisley East station on Glasgow Road to Dykebar station at Hawkhead Road. The branches met up at Blackbyres junction near where the Barrhead fire station is now before heading for Barrhead New, Barrhead South and Lyoncross near Newton Mearns . 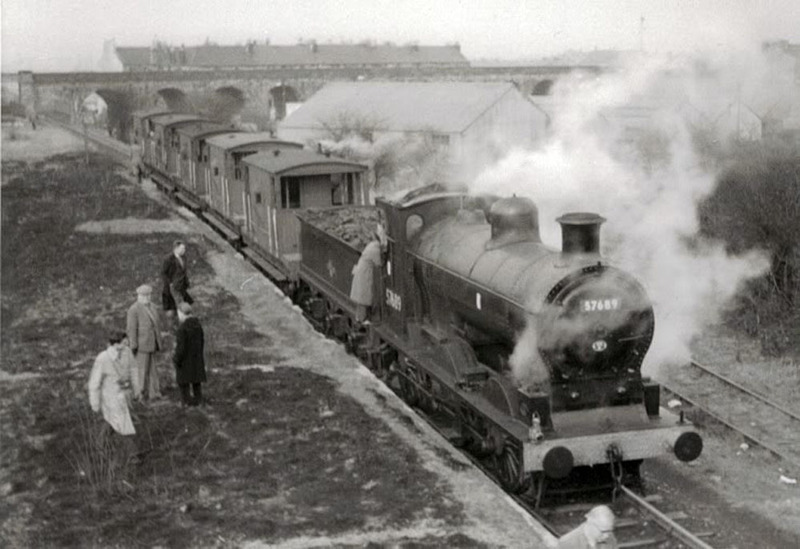 The upshot of the loop not being completed was that for example, a train delivering coal to the Cecil Street depot near Glasgow Road had to go several miles round the outskirts of the town from St. James to Barrhead then back to the east end instead of the short distance from Arkleston ! Incredibly the stations were rented out as private houses apart from Paisley East which became a garage. It must have felt like a very long earthquake when a 50 wagon coal train went through. The only passenger trains that travelled on the line were special excursions, one railway enthusiast outing in 1951 and a few sunday school trips. No regular passenger services were ever scheduled. Some excitement was generated during construction when a public row erupted with the rival Glasgow and South Western Railway who were competing in what was known as the railway 'battle of the braes'. 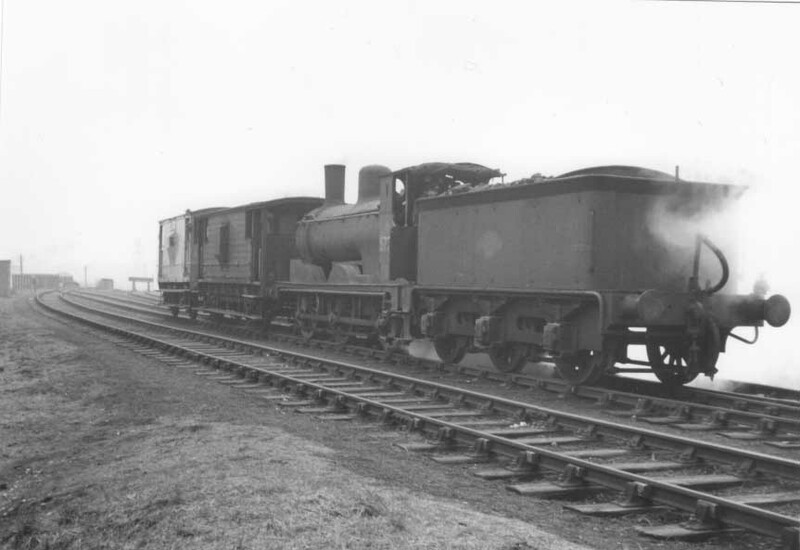 From a contemporary account, “G & SW so planned the Barrhead extension to its Potterhill branch so that the Caledonian was forced to make an alteration in its levels, an embankment becoming necessary where none had been planned. Charles Forman, the engineer, complained that the Potterhill-Barrhead line 'has evidently been laid out to interfere with and hem in this company's line 'as much as possible'. However, the Caledonian forced the G & SW to pay the cost of the materials for the embankment.” The Potterhill line is on another page on this site. The story of the dummy railway has generated a lot of interest over the years. There was an article in the Canadian National Railway's magazine in 1955 (read it here). Local historian David Rowand relates some stories on the subject in his book 'Paisley'. Trains he writes were used to transport wounded soldiers in world war I to Paisley East then by bus to Ralston hospital, thousands of American GI helmets were dumped in the scrap yard near Lacy Street and also passes on a local legend that one of the trains carried an anti aircraft gun on board during WWII. Incidentally, the name 'dummy railway' comes from the practice of building fake, decoy objects during wartime to take the enemy's fire away from real assets. During WWII, dummy railways, marshalling yards, docks, airfields and towns were built in England and the Germans even dropped dummy paratroopers in Belgium. 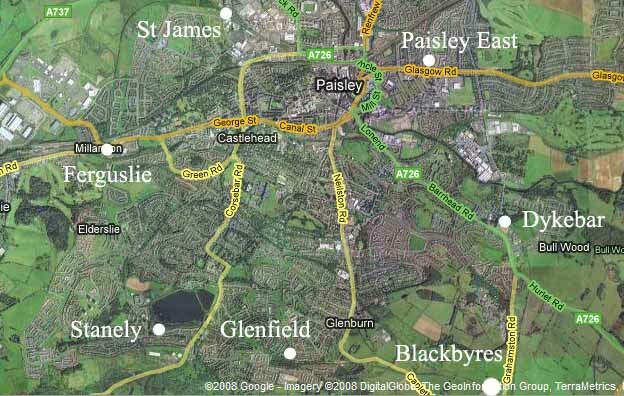 Below is a map of Paisley with the stations marked. The rest of this site charts the route of the railway with some wonderful old pictures taken by famous railway photographers and some more up to date ones. The photographs by GH Robin are reason enough for the site in themselves. The fact that they are railway oriented is almost incidental. Point the mouse at the photographs for a description, click on them to open a new page with a full size version. Due to the large number of photographs, this section is divided into four pages, please click below to continue .